Bank of America spent $4 billion in the second quarter to cover litigation costs, including a mortgage settlement with American International Group. Bank of America Corp., the second- biggest U.S. bank, said profit declined 43% as it spent $4 billion to cover litigation costs, including a mortgage settlement with American International Group Inc.
Net income fell to $2.29 billion in the second quarter, or 19 cents a share, from $4.01 billion, or 32 cents, a year earlier, the Charlotte, North Carolina-based lender said today in a statement. Earnings excluding litigation costs were 41 cents a share, 12 cents more than the average estimate of 24 analysts surveyed by Bloomberg. Mortgage-related legal expenses continue to dog Brian T. Moynihan, 54, in his fifth year as chief executive officer. Through the first quarter, the bank had booked more than $55 billion of costs tied to home loans, foreclosures or bonds backed by mortgages, mostly because of his predecessor’s 2008 purchase of subprime lender Countrywide Financial Corp. The second-quarter legal costs included a $650 million deal to resolve all mortgage-bond litigation with insurer AIG. Most of the quarter’s litigation costs are related to negotiations with the Justice Department, Chief Financial Officer Bruce Thompson told reporters today. The $4 billion expense was “way more” than the $1.25 billion estimate of Chris Kotowski, the Oppenheimer & Co. analyst said in a research note. Pre-provision earnings were “mildly disappointing” because of a shortfall in mortgage profit, he said. U.S. prosecutors have asked for $17 billion to resolve probes into the lender’s sale of mortgage bonds before the financial crisis, a person with knowledge of the matter said in June. Talks stalled last month because the Justice Department was dissatisfied with the bank’s offer of more than $12 billion, the person said. Bank of America fell 4 cents to $15.77 at 8:36 a.m. in New York. The shares gained 1.5% this year through yesterday, trailing the 4.2% increase of the 24-company KBW Bank Index. Revenue in the quarter dropped 4.3% to $22 billion as expenses climbed 16% to $18.5 billion because of the litigation costs. AIG had objected to a proposed $8.5 billion settlement between Bank of America and a group of mortgage-bond investors, saying the sum was too small. The dispute focused on mortgage bonds from Countrywide. Investors have been demanding that the bank repurchase loans that were based on faulty information. Global markets, the bank’s trading operations overseen by co-Chief Operating Officer Thomas K. Montag, posted a 14% profit increase to $1.1 billion, driven by higher investment gains. Revenue from trading fixed income, currencies and commodities rose 5.2% to $2.37 billion, excluding accounting adjustments tied to derivatives and structured liabilities, the company said, citing improvements in mortgage and municipal bond activity. Equities trading revenue slipped 14% to $1.03 billion from a year earlier. Consumer and business banking, part of retail operations overseen by co-COO David Darnell, saw profit jump 29% to $1.79 billion as credit costs declined. The net loss from consumer real estate, which includes home lending, widened to $2.8 billion from $930 million a year ago on the higher litigation costs. Profit at the wealth-management division, which includes the Merrill Lynch brokerage, fell 4.6% to $724 million on higher broker incentives and technology spending. 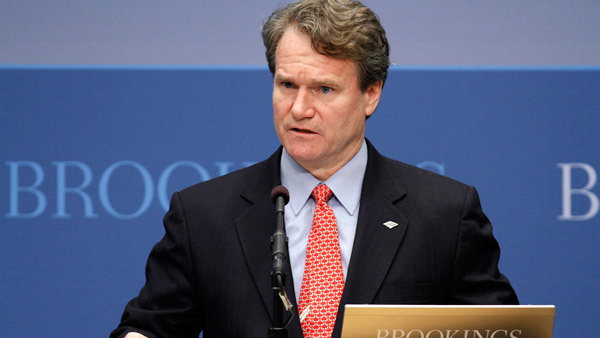 Bank of America or firms it acquired issued about $965 billion in mortgage bonds before the financial crisis, with three-quarters coming from Countrywide, according to an April research note from Sanford C. Bernstein & Co.
Moynihan said during a May investor conference that the Justice Department probes are the biggest legal issue to be resolved. The severity of the mortgage hangover, which caused a $276 million first-quarter loss, and the time it has consumed are the biggest disappointments of his tenure, Moynihan said. Another cloud hanging over the bank: In April, it suspended plans for higher dividends and share repurchases after finding an error in its stress-test submission to the Federal Reserve that inflated capital levels by $4 billion. Bank of America resubmitted a capital plan in May, saying it scaled back an initial request to raise the dividend to 5 cents a share from 1 cent and to buy back $4 billion of stock. JPMorgan Chase & Co., the biggest U.S. bank, said yesterday that second-quarter profit fell 7.9% to $5.99 billion. San Francisco-based Wells Fargo & Co., the largest home lender, last week reported a 3.8% increase in net income to $5.73 billion on lower credit costs. Citigroup Inc.’s profit beat analysts’ estimates after the bank announced a $7 billion mortgage-bond settlement earlier this week.